It was the Turkey Day on Thursday - an annual thanksgiving event in the United States. As this year's thanksgiving day approached, talks about whether or not to buy, cook and eat turkey became a major point of discussion among people, before another discussion prompted by another turkey matter, cropped up in the news. This new turkey was not really not new, just like the turkey many Americans had on their dining table on Thursday The new turkey had roughened feathers for bringing down two jet bombers in a country between Europe and the Arab world, where it shares a common border with Syria. When you mention Turkey in America (as a country), not many people pay attention, because the turkey for the dining table seems more attractive and popular here for its appetizing and deliciousness. No one will talk about Turkey as a country and attach it to anything about delicacy, and not even in diplomacy. And Turkey as a country is not so much attractive to Syrian leader, Bashir al-Assad, and Turkey too doesn't care a hoot about Assad, But it wants to be in Europe and its application for the EU membership has been waiting the EU's approval, but it is yet to be granted. Some smart observers say that Turkey is flexing muscles to press the EU and encourage its inclusion in the EU, where it is not wanted anyway. But Turkey's Tayyip Erdogan had in the past boasted that Turkey is careless whether the EU admits Turkey as a member or not. However, Turkey is a member of the North Atlantic Treaty Organization, NATO. And for downing two jet fighters, Turkey has almost taken the position of turkey that we eat during thanksgiving day in America in human discourse here and other parts of the world. It has succeeded at putting Paris attack and the Belgium lockdown out of the news temporarily. Turkey with its capital in Ankara, suddenly assumed a frontline position in popularity, connecting with the world view that it sometimes require acting stubborn to be known. But Turkey said it had not acted as a rogue for the downing of the Russian jets, which it claimed violated its air space. It had shown recorded dialogue that it had warned Russia to steer clear of its air space on several occasions and Russia had been deaf to its warnings. But Russia said Turkey's claim was false, showing that its jets had passed through Turkey for mere nine seconds and over a tiny space belonging to Turkey and that its jets were shot down on Syria's air space. Russian President Vladimir Putin said Turkey's downing of the Russian jets was a stab in the back with his usual swagger.. But some world leaders expressed opinion said Turkey had every right to defend its air space. But observers wonder about how Turkey could be protecting an air space, when it could hear the loud discourse about the need to bring a rain of bomb on the ISIS after the attack on Paris. And they ask whether Turkey doesn't belong to the civilized world, because not many people are aware that Turkey is between the civilized world and the other side. They ask whether Turkey isn't aware that Russia and France and the United Kingdom have announced their intention to fly bombs into the ISIS position in Syria? A shocker came from Russia when it shot back that it had evidence that Turkey's action was premeditated against its jets. It had demanded apology from Turkey, but Turkey had said it would not offer any apology for defending its air space. A real threat appeared against an anticipated alliance toward taming the ISIS. But Russia had said that despite the downing of its jet, it was still ready for an alliance against the ISIS. Observers see this as a smart diplomatic move from Russia. They say Russia and Syria's strongman Bashir al-Assad need the ISIS out of Syria more than anyone else. In fact, the ISIS's confrontation against the world favors Putin on one hand and Assad's cause on the other. The ISIS has become number one threat to Assad. The pro-democracy fighters occupy a secondary position in the list of dangers to Assad's hegemony. Both the pro-democracy group and ISIS are like sore thumbs Assad wants to be cut off, because no man want enemies right at his door step. Aside from the threat to Iraq, which the ISIS constitutes and then to the civilized world, the world would have wished to leave the ISIS to settle the score with Assad. But the fear of the ISIS's threat to the civilized world has made Assad a beneficiary of every effort needed to quench the ISIS's fire. 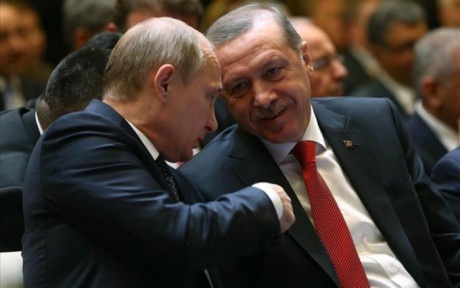 And so Turkey's position against Russia is seen as opposition against the resolve to take out the ISiS. And now that Russia has expressed intention to cooperate with the US against ISIS, though people are doubting the workability of such cooperation between the two countries, they are asking where they are going to push ISIS, since it is not quenchable and no country will want ISIS in its territory. ISIS is seen in the of human habitation as an equivalent of a bad turkey that no one wants to have anything to share with it or eat it. Now, the battle between the civilized world and ISIS is nearing an equation of the battle between God and Satan, with the latter expelled from haven into the world of humans, and has since been terrifying to humans, and humans were never had a choice to accept or reject Satan in their midst. Unfortunately, Satan has chosen to remain in the world of humans, as it has refused to return to heaven, because it cannot withstand the ferocious fire-power of the almighty. Will any country on earth be equivalent to heaven in term of God's ferocious fire-power and be damning to ISIS, just as God's power has been damning to Satan and his entourage? But no country seems to be ready to face ISIS all alone.